Banh Chung (Square rice cake) and its Southern variety called Banh Tet - is unique to Vietnam's Tet holiday, though many other countries (China, Japan, Korean, Singapore, Taiwan) celebrate this holiday as well. 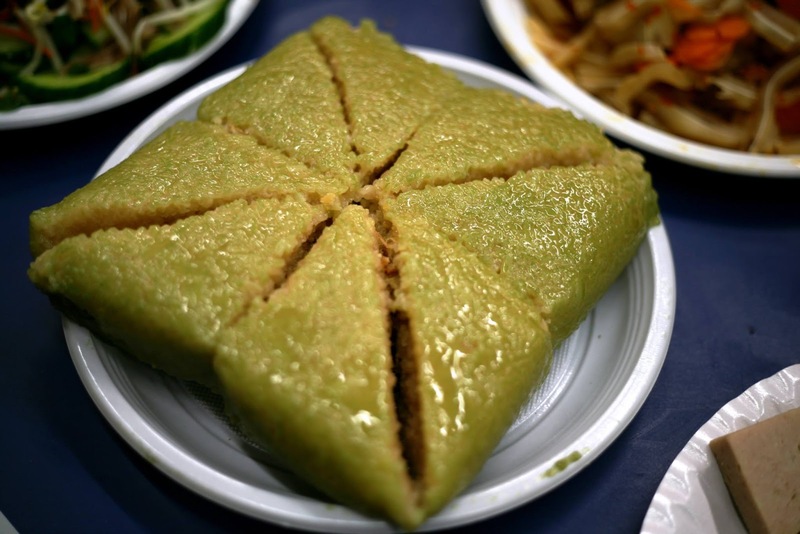 Banh Chung is a food made from glutinous rice, mung bean and pork, added with many other ingredients. Banh Chung is covered by green leaves (usually banana leaves) and symbolizes the Earth, invented by the prince Lang Lieu from Hung King dynasty. 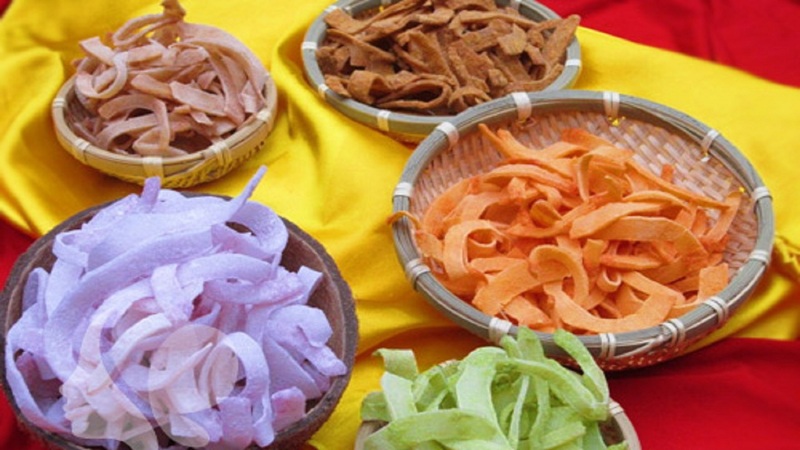 Besides traditional reason, Banh Chung is chosen as the main food for Tet holiday because of it can last long for days in the severe weather of Vietnam (Banh Chung can survive at room temperature for nearly 1 month). Xoi (Sticky rice) is also a very important part of Tet holiday in Vietnam, since the meals to worship the ancestors can not missing this dish. Moreover, along with Banh Chung, xoi is the main staple foods for Tet holiday. Xoi in Tet holidays can be seen in many forms: Xoi Lac (sticky rice with peanuts), Xoi Do Xanh (sticky rice with mung bean), Xoi Gac (sticky rice with special “gac” fruit). Among these types, xoi gac is favorite the most by people because of its special red color – symbolizes the luck and new achievement for the New Year. Xoi is usually served with Gio Cha or boiled chicken in Tet meals. Sometimes it can be served with Che (sweet soup) like a dessert. Thit ga (boiled or steamed chicken) plays an important role in Tet holiday cuisine because all the tribute meals to the ancestors must contain a boiled chicken, whole or chopped. Chicken meat in Tet meals are various in forms: usually chicken are boiled and sliced, but sometimes people can place the whole chicken in a plate, or nowadays some families use roasted or fired chicken to replace the original boiled ones. Chicken meat is served with Xoi (sticky rice) and Banh Chung, and become one of the most popular main dishes in Tet holidays. 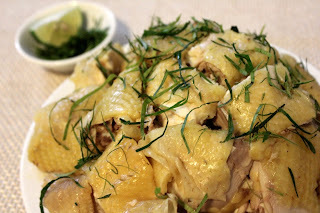 Boiled chicken are always go with sliced lemon leaves and salt-and-pepper sauce, as a tradition. Chicken (especially bones, legs and heads) can be used to prepare the broths for other soups. 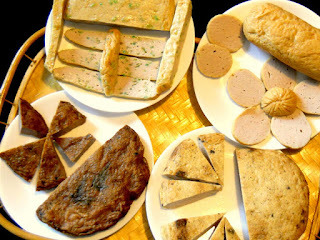 Mut Tet (Tet jam) is not a food to serve in a meal during Tet holiday, but more like a snack to welcome guests in this special period. Mut is always kept in beautiful boxes and placed at the table in the living room, and it is the main food for the owners and guests to taste when they’re talking, enjoyed over a cup of tea. Unlike Western jam, which is usually in liquid form and served with bread, "Vietnamese jam" is mainly in dry form, usually dried fruits and some kind of seeds (pumpkin seeds, sunflower seeds, watermelon seeds). This once-in-year mix of snack is very large in variety, with so many tastes: ginger, carrot, coconut, pineapple, pumpkin, lotus seed, star fruit, sweet potato. Nowadays, cake and sweet are slowly replacing jam in Tet period, but many people still love the taste this unique food – an angle of Vietnamese culture. If you still don't have any specific plan to discover Vietnam, you can refer to these Vietnam tour schedules. We offer many different types of travel from adventure tours to luxury cruises or beach holidays in Vietnam to help tourists to fully explore Vietnam in landscapes, culture as well as cuisine.